Below is a complete list of unusual adventure holidays hand-picked by the experts at Another World Adventures. Find a trip you love and make an enquiry for full details and info on how to book. Join a team of 16 women to contribute to and learn more about the lives of Malawian women and young people. Travel Alaska's wilderness in a converted school bus for grizzly bears, glaciers, kayaking and much more. Enjoy Alaska's coastline on an action packed 9 day adventure: Whales, Glaciers and Sea Kayaking! Travel in a converted school bus through the wilderness of Alaska for bears, glaciers, kayaking and much more. Explore Antarctica one of the world's last wildernesses on a tall ship sailing expedition. Hike, surf and kayak on a 10 day adventure through El Salvador. Intensive sail training and a huge adventure on this Bay of Biscay passage Making Masterclass. A destination for the true explorer, the nature lover, and the traveller who feels like they’ve seen it all. Bulgaria's idyllic terrain, impressive historical wonders and heartwarming culture is ready to be discovered. This voyage offers a great mix of active but comfortable sailing and exloring at least six islands. An epic marathon running adventure that takes you from the Great Wall of China to Beijing and Shanghai. Travel to Cuba and embark on an incredible sailing trip around the Canarreos Peninsula. Two weeks of amazing Cuba sailing as we explore its coast, paradise islands and magical cities. A sailing adventure from the beautiful city of Copenhagen, down to Germany's Baltic coast, to Portsmouth. 8 days of surf lessons and active adventures through El Salvador. 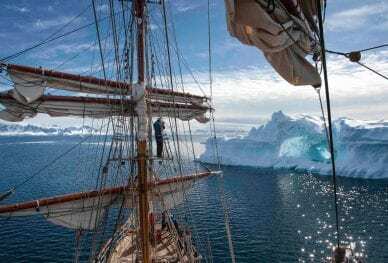 Expedition sailing holiday exploring awe inspiring, wild, remote Spitsbergen.